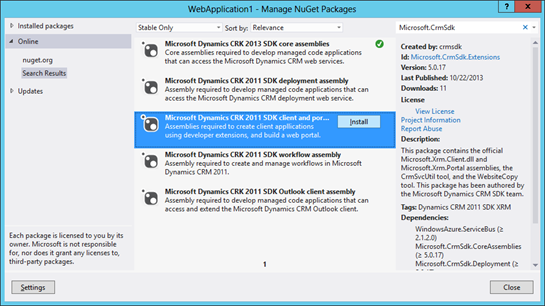 NuGet has become the de-facto way of managing assembly references from within Visual Studio. Using the Package Manager you can easily download, install, update and uninstall referenced libraries automatically from the ever growing NuGet library repository. If you search for Microsoft.CrmSdk in the Online tab, you will see a list of the official SDK assemblies. All referenced assemblies are stored in a single solution folder named packages so that each project will reference the same assembly version inside your solution. You can update to the latest version using the 'Updates' tab inside the NuGet Package manager (or a specific version using the command line package manager). You don't need to commit your dependency packages to Source Control. If you commit only your code to source control and then try and build the project on a new environment, you can easily re-download the assemblies from within the Package Manager using the 'Restore' button. If you want to automatically restore these files on build – you can Right Click on your solution and selecting 'Enable NuGet Package Restore'. See the article on the NuGet site for more information. Start using NuGet if you are not already and you'll never look back!